The sides? Well, apart from the frontfender, everything else is exactly the sameand is disappointing, after all, this vehicle issupposed to be the next-gen Scorpio. Theheadlamps now wrap around the fenderthat also features a mock vent like bezel, theside cladding is exactly the same, and onlythe front section has been redesigned sinceit is part of the new face. Larger 17-inchwheels (16-inch in the previous model) lookgood but are more car like than SUV. Thewheels however fill up the arches well.Move to the rear and you know it is aScorpio even though the design is a lotbusier than before. A black applique runsacross the upper part of the tailgate. Itlooks better on a darker shade like the blueScorpio you see here, but the silver numberplate garnish is boxy and loud. The basemodel is in fact easier on the eyes since itdoesn’t feature any contrasting garnish.The window is now smaller and the visiblearea even less. But it doesn’t affect visibilitysince the outgoing model’s rear windowwas unnecessarily large. The windowshape is unique and complex, even therear defogger grids aren’t straight lines butangular. The clear lens tail lamps are newand feature bright LED lighting but thechrome insides look aftermarket especiallyduring the day. However, the verticalpillar-mounted reflectors have now beenditched for non-reflective black inserts. The interiors on the new Mahindra Scorpio have been heavily reworked too. And for the better. The dashboard is all new, as is the steering, the door trim and the seats. The dash with its layered design looks more upmarket now and the choice of materials, colours and the attention to fit and finish is a huge improvement over the outgoing Scorpio. The instrumentation is more in line with the new Scorpio’s youthful aura while it remains easy to read and throws up a decent amount of info including gear indication. The operability of controls – dials, buttons, stalks et al – is crisper and better dampened too on the new Mahindra Scorpio. Mahindra has paid attention towards improving the ergonomics as well. The aircon vents are not only better shaped, their effectiveness has improved as well. Also, the power window switches have now moved to the doors from the central console as on the previous Scorpio. Though this is thoughtful change, it has negatively affected how one works the driver side seat height adjustment; it leaves no space between the seat and the door to put your arm in. We would have also liked the front armrest to have more adjustability; currently, it moves along with the seat back, which is quite pointless. As for space, there isn’t a big improvement over the older Scorpio. Having said that, apart from lack of elbow room upfront, there’s nothing to complain about; there’s more than adequate room all round be it for head, knee or shoulder. And the boot with the jump seats folded offers good luggage room. Mahindra has garnered a reputation of delivering an exhaustive features list on its products. The new Scorpio is no different. It is comfortably the best equipped SUV in its class, at least in this top of the line S10 trim. 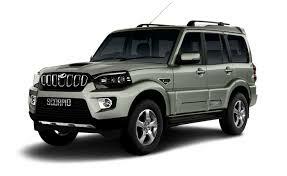 The new Mahindra Scorpio S10 gets a touchscreen multimedia system with Satnav and bluetooth. There’s reversing aid, climate control, cruise control, a multi-functional steering wheel, rear AC vents, power ORVMs, automatic headlamps and rain sensing wipers. The new Scorpio also gets a strut operated bonnet and this is important because it tells us Mahindra’s intent of moving up the premium ladder by offering convenience related bits the lack of which aren’t exactly deal breakers in this class. The Scorpio remains a ladder frame chassis with a live axle at the rear. In the face of the monocoque, front-drive competition will be a disadvantage for on-road dynamics. Mahindra claims that the torsional rigidity of the chassis has been increased significantly, and that it is now a modular platform that will give birth to more vehicles. Judging from the way the front and rear of the Scorpio feel connected while going around a corner, I believe them. The Scorpio rides almost as well as the Duster, with no discernible difference most of the time. Where the Scorpio lags behind the Renault is in steering feel – it weighs up well, but there is no clear message sent to your fingertips when the wheels are losing grip. The Duster delivers the message better. Another thing that works in the Duster’s favour is the front-drive architecture – it will always understeer. The Scorpio’s rear drive means that it can get unpredictable on the limit, so if you’re going to drive around corners quickly, the Scorpio isn’t for you. However, if you’re going to use your SUV off-road, the Scorpio becomes the automatic choice because the very things that make it not as good a road car as the Duster will have it scampering out of sight of the Renault when the going gets tough. It would also be my choice for cross-country trips thanks to Mahindra’s widespread service network. Mahindra Scorpio is comprised with caliper type ventilated disc brakes at the front while at the rear, drum brakes are present. In addition to this primary braking system, there comes Anti-lock Braking system as secondary braking system for immediate and emergency braking purposes. Although, ABS ain’t a standard safety feature across the entire variant range but it is available S6+ trim onward on this SUV. The company has offered dual front airbags as safety feature, albeit with top-of-the-trims – S8 and S10. However, the S6+ trim comes loaded with a front driver side airbag as standard feature. In addition, there are side intrusions beams for added safety; but, what irony, the entry-level S2 variant is even deprived of them. A special mention goes to Mahindra’s Voice assist system which timely keeps reminding the driver regarding the door ajar, seat belt warning, low brake fluid, and fuel on reserve. It is on offer with S6 grade onward as standard feature. Also, one gets to see the Tyre-tronics system with the Scorpio which is an indispensable safety feature as it keeps on updating the driver about the exact air pressure and temperature in each tyre. Apart from the aforementioned features, there are a few more features which ensure the safety of the occupants as well as vehicle, directly or indirectly. These features are Digital immobilizer, Anti theft warning, Seat belt reminder lamp, Speed alert, and Auto door lock while driving.